Quantic Dream has been exceedingly busy since its last release, improving a proprietary game engine in order to drive their vision for the future of interactive entertainment forward. The fruit of their hard labor is seemingly set to finally pay off with the eventual release of Detroit: Become Human. We were able to sit down in a behind-closed-doors presentation of a slightly different take of the scenario seen at Sony’s E3 2017 press conference, one where we were able to see more of Marcus’ abilities. Here is what we saw. In case you missed it, the scenario as seen at Sony’s E3 2017 press conference showed us Marcus, an android that has somehow become sentient, and is hell-bent on freeing other androids. Marcus appears to have a special ability which allows him to do this by simply holding onto other androids for a short while. Sony’s press conference showed us the scenario play out in two different ways – one where Marcus abandons the mission as soon as the local police show up, and another whereby he sneaks past law enforcement’s presence, is able to free fellow androids, and sends a message to the humans in the form of a violent riot of sorts. During the presentation time we spent with the game, we were shown an extended version of the scenario shown at Sony’s conference. Most things in the lead-up remained the same. Once the police rolled by, however, we were able to see some of Marcus’ abilities in action. For instance, he can run through simulations of various routes to take. In this case, Marcus was trying to take a drone out. Some routes, such as leaping off a tree, resulted in him being too far away. This is shown as a wireframe model of Marcus climbing and attempting to reach the drone as it flew on its route, something which Marcus was able to glean knowledge of using his scanning powers. After trying a couple more simulations, the correct one was finally stumbled upon, and then executed. All of these simulations and scans of the environment are done in what Quantic Dream calls a “mind palace.” By holding R2, time freezes, and the player is able to look around for points of interaction. You are also shown any current objectives you’ve been asked to finish. Detroit: Become Human has an in-game interface that shows up blended seamlessly into the game world. 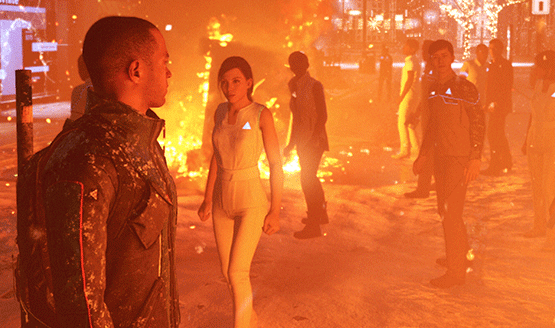 It’s another way Quantic Dream tries to keep immersion going strong in their titles. This is something that appears to be able to be called at will – there’s no sort of time limits in how long you can stay in this mode, and you are free to explore your surroundings for as long as you want. Once the police drone was taken care of, Marcus and partner North were able to locate their target: a store where other androids are sold to humans. Marcus quickly scanned the store, and discovered a link to the store’s security network. Some worker androids were busy repairing a conduit into the network (a little too perfect of a coincidence in this writer’s opinion, but we’ll roll with it). So Marcus hopped down to their level, freed the androids, and told them to “go to Jericho,” which sounds like a city made by awakened androids, for awakened androids. With the worker androids out of the way, Marcus was able to hack the building’s network. This was accomplished in true Quantic Dream fashion – the player simply had to hold down one, then two, then three, then four buttons at the same time for long enough. With the security network knocked out, Marcus and North needed something big to bust open the front of the android store. A nearby truck did the trick. 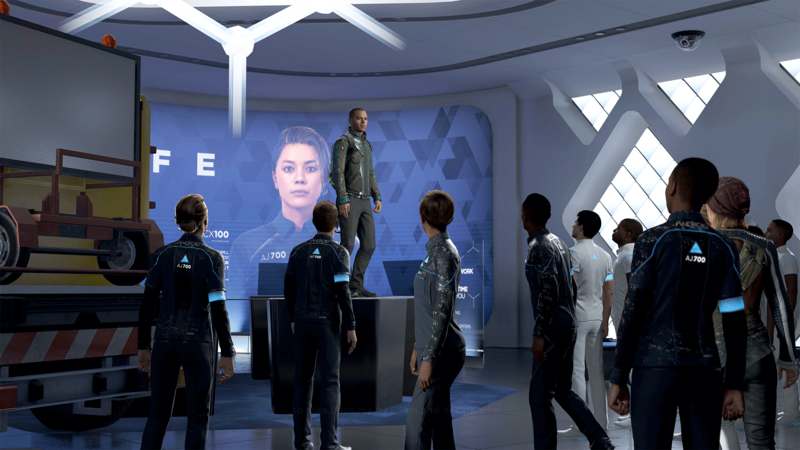 Marcus awoke the shop model androids, and then made a speech, getting the androids to rally up for the cause. It was time to send the humans a message, and where Quantic Dream’s signature choice mechanics came into play. Marcus could choose between a variety of pacifist or violent actions, from tagging a bench or destroying it, to moving automated cars, or tipping them over, and more. Each action added to a bar that moved between pacifist or violent, in varying degrees depending upon how extreme of an action was taken. We saw Marcus take a violent route again; this was a shame, because we had seen the violent version in the trailer before. It would have been interesting to see how the scene would have played out if Marcus chose the pacifist route; it appears Quantic Dream is keeping much of the game close to the vest. I will admit, the trailer we saw at Sony’s press conference this year didn’t hit me the same way that last year’s did. It scaled my expectations back a bit for this game. However, the demo we saw helped to alleviate some of the hesitation I felt. The nuanced “pacifist/violent” meter for the potential riot in the shown scenario indicates that this developer is continuing in the path that they have laid out for themselves, writing interactive entertainment with so many possible permutations, that replaying the game is a must. Detroit: Become Human currently has no set release date, but will hopefully be in our hands sooner rather than later.